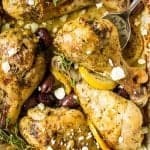 One of the easiest recipes of Mediterranean cuisine… Chicken Riganati or Greek Lemon Roasted Chicken is juicy, tender and requires just a handful of ingredients. Prepare it for a weeknight dinner or for a special occasion. You’ll love the lemon and oregano flavor of the dish and the easiness of putting it together. My idea of a perfect weeknight dinner is one that doesn’t require me to spend hours in the kitchen. Moreover, lately I’ve been on a “mission” to finish with the dinner prep as well as main daily blogging tasks before 3 pm. My older daughter goes to preschool and I love being able to pick her up earlier so that we all can have a quality mom-daughters time before the bedtime. When it comes to cooking, my chicken recipes always include a whole lot of spices. My pantry is literally overloaded and I would usually incorporate at least 5 different spices into my regular chicken recipe. So, when I made Chicken Riganati or Kota Riganati, I was pleasantly impressed with how so little ingredients can produce such a delicious and succulent meal. Greek food as a part of the Mediterranean Diet is by default considered one of the tastiest in the world. The simplicity and the abundance of vegetables in the recipes’ ingredients make it one of the healthiest cuisines. What’s interesting is that without realising this, Mediterranean food is the one we tend to order the most for take out. I can’t get enough of it and their garlic sauce is one of the kind! And when it’s summer and hot outside, there’s no salad recipe that I make more often than Greek Chicken Panzanella. Super flavorful and my family loves it! Back to our Greek Lemon Roasted Chicken. The recipe comes together super quickly. Your oven will do the rest of the job. Make sure you use a freshly squeezed lemon juice and if possible Greek or Mediterranean Oregano, which tends to have the most earthy and savory flavor. To prepare the recipe, drizzle chicken with olive oil and freshly squeezed lemon juice. Then, rub it with oregano, garlic, salt and pepper. Pop it in the oven and wait for the magic to happen. Juicy, flavorful and delicious chicken is calling your name. 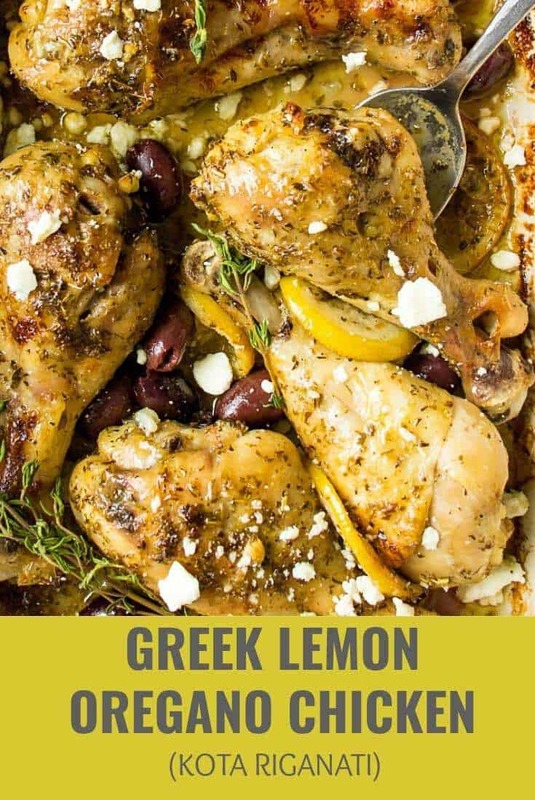 This Greek Lemon Chicken is one flavorful meal that will cheer you up after a long day. Let me know in the comment section below if you love Greek food and what is your favorite recipe? If you make Chicken Riganati, don’t forget to snap a picture and post it on Instagram with a hashtag #lavenderandmacarons. I’d love to see your creations. Fall-off-the-bone CHICKEN RIGANATI is truly a comfort food made with just a handful of available ingredients. Super juicy, flavorful and delicious! 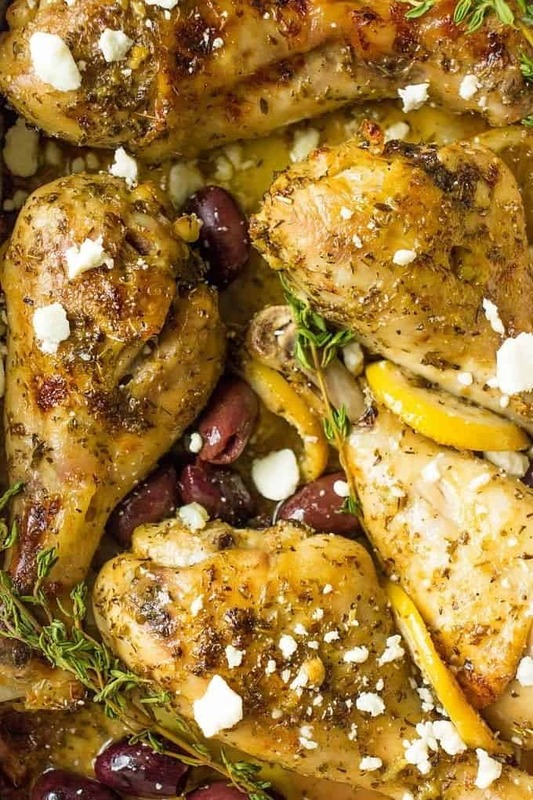 Drizzle chicken with olive oil and lemon juice. In a small bowl combine oregano, garlic, salt, pepper and rub it into a chicken. 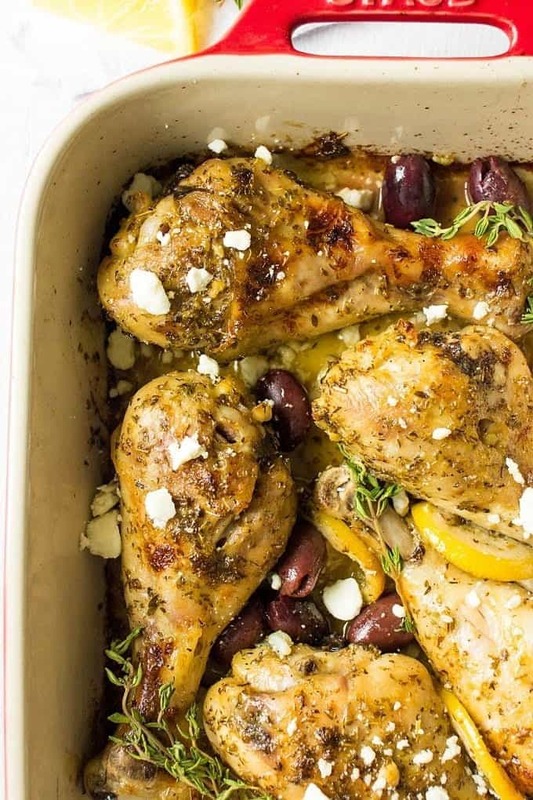 Remove from the oven, sprinkle with Kalamata olives and Feta cheese. Serve with roasted or mashed potatoes, pasta or steamed rice. *For this recipe, you can also use chicken breast or chicken thighs. **I used 1.25 qt rectangular baking dish. ***If you want your chicken to have an extra crispy skin, turn on a broiler and broil it for a few minutes keeping an eye on it at all times. You can use 4 chicken breasts. And I would bake it 450F for about 18 minutes. Then , you can remove it from the oven, cover with a foil and let it rest for 10-15 minutes. If you have an instant meat thermometer, it should read 165 F. Hope this helps! Now that’s my kind of meal! Love all these flavours, and it sounds so simple to make. It looks delicious! I am always looking for extra oven baked chicken recipes, as they are so handy on busy week nights! I made this last night with chicken thighs and served it with bread and salad. Thanks for your comment Claire! I’m so glad you liked the recipe! What a delicious CHICKEN RIGANATI! I simply cannot wait to try it! Very interesting combination of ingredients. I am saving this recipe for later. YUM! I never heard of chicken riganati before, but it sure looks like my kinds of preferred meal! Sounds absolutely delicious! This looks so delicious. 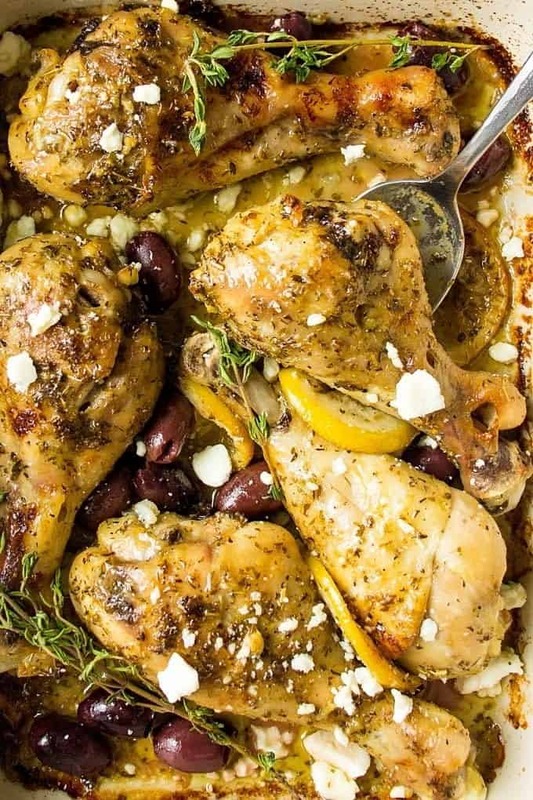 I am a big fan of lemon chicken and the addition of feta and olives to create zesty, bright and salty flavours sounds amazing! Thanks Marie! Yes, olives and Feta intensify the flavor of the dish even more.